Do you know the Pros vs. Cons of common types of hair extensions? There are several types of methods of adding length and volume to your hair, but they can have long term damage, and are very expensive! 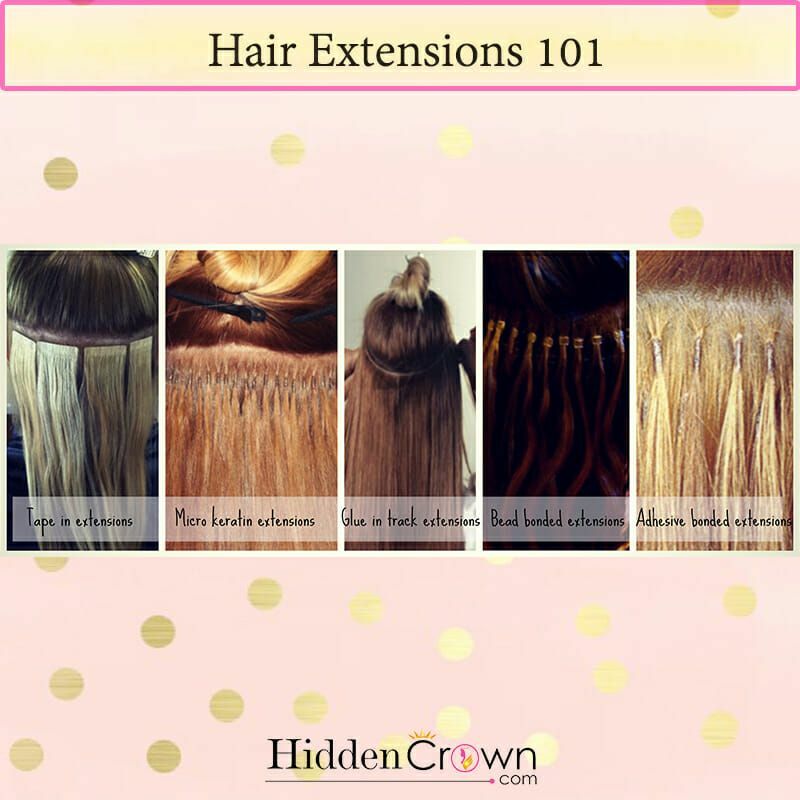 Hidden Crown Extensions are halo-shaped extensions that are DAMAGE FREE! About: A set of clip-in extensions usually averages eight strips of hair. It also varies in lengths and widths from usually 2-8 inches. This type of extensions can be worn for an entire day, but needs to be removed before sleeping. Clip-in extensions are worn for special occasions or on a daily basis. Pro: Clip-in extensions are temporary. You can wear them once in awhile, or everyday, and take them out at night. Con: Clip-in extensions do pull on your natural hair, and there have been many reports of instances where clip-in extensions rip out parts of the hair on the scalp and leave bald spots. About: Bonded extensions uses a method of weaving that lasts for a shorter period of time in comparison to sew-in weaving. Bonding uses the application of hair glue to a section of wefted hair then onto a person’s natural hair. There are 2 types of bonding methods: soft bond and hard bond. Soft bond is flexible and comfortable to wear and is made using latex/acrylic based adhesives. Hard bond, uses adhesives such as glue. Pro: Bonded extensions last about four to six weeks, and are semi-permanent extensions. Con: Hard bond adhesives are not comfortable because they are rigid. Since does generally last 4–6 weeks, they need to be maintained by a professional frequently. They also can cause horrible damage to your hair. This type of extension is expensive due to the price of human hair as well as application. 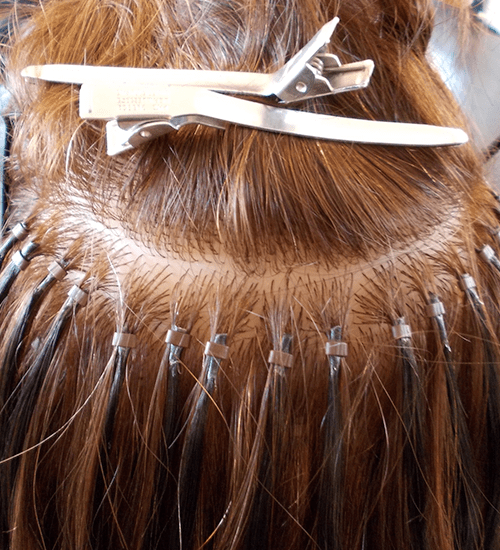 About: The fusion method involves a machine similar to a hot glue gun used to attach hair extensions to individual strands of the natural hair of about They need repositioning every 2–3 months as the natural hair grows. Pro: Permanent type of extensions and last about 2-3 moths. Con: Due to various chemicals in the glue, which may cause hair loss and scalp irritation, combined with heat, this method is more damaging to natural hair. This type of extension is expensive due to the price of human hair as well as application. 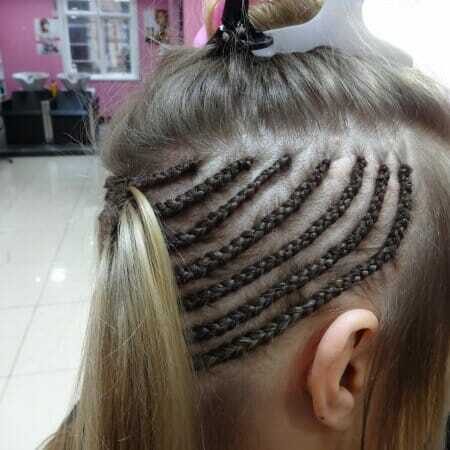 About: Tracking involves braiding an individual’s natural hair. Starting from the bottom, the hair is sewn horizontally across the head from one side to the other. 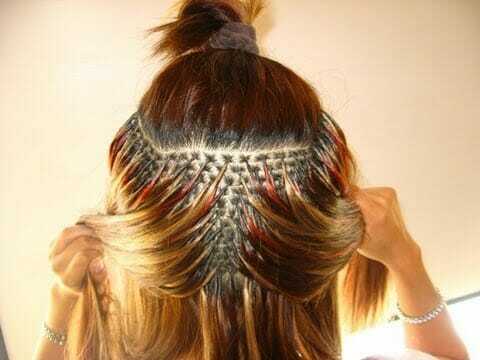 A weave can consist of a few tracks, or the whole head can be braided for a full head weave. Pro: Weave extensions are a quick way to add length. Con: A track will last 2-3 months because the hair will eventually become matted and tangled. This type of extensions is very expensive, painful, and you cannot remove it from your head. About: The Hidden Crown has 140 grams of the finest quality REMY hair to add instant length and volume. (12 inch Hidden Crown has 120 grams). 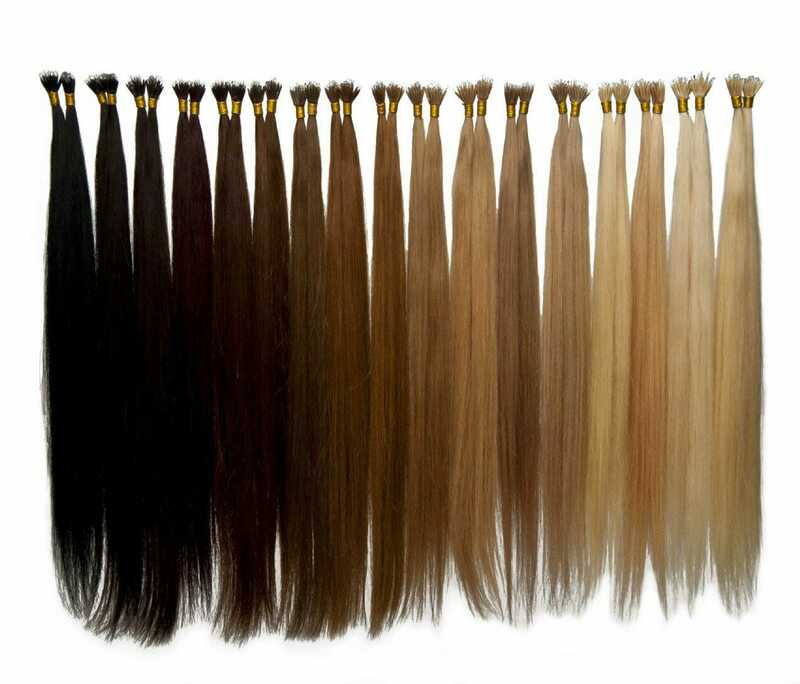 This is the same amount of hair purchased for a full set of clip or bonded extensions. Remy hair is the highest grade of human hair on the market. This is because the hair still has it’s outer cuticle layer and all of the follicles face in the same direction. This advantage makes your Crown last longer, stay shiny, silky, and tangle free. The Hidden Crown is also double drawn hair. This means the strands are the same thickness from root to tip as opposed to hair that becomes wispy at the ends. 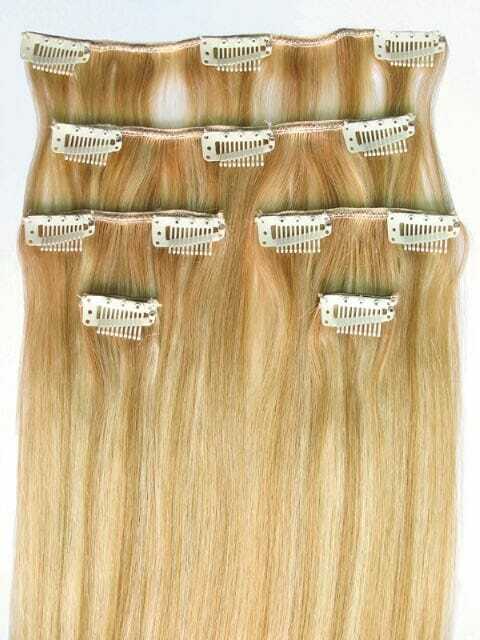 This process is very laborious, and therefore makes the extensions more expensive, but the best quality. Con: NOTHING! We have had comments about soreness from the wire, but this problem is due to an improper fitting by the wearer. Our Hidden Crown YouTube channel can show all information about Hidden Crown Extensions, even how to re-wire your Crown!